This sink came in undamaged and exactly as pictured. Good quality and packaging. I like that it’s shallow so small children don’t have a hard time reaching it to wash hands as they do with some other vessel sinks. Nice color. Nice thickness. 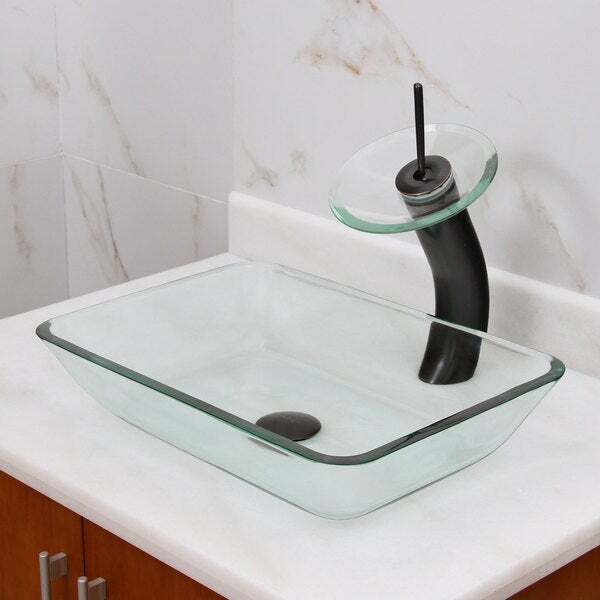 The gorgeous rectangle tempered glass bathroom vessel sink features the essence of porcelain art. Each pattern is 100-percent handmade and 2516-degree temperature baked. Bring elegance to your bathroom with this gorgeous vessel sink. The best thing about this product is its tempered glass. I love the fact that it isn't that delicate like the regular glass material so this is a great addition to our guest's bathroom. Perfect sink for atop beautifully colored granite countertop like mine. One easily solvable issue: the drain doesn't allow sufficient water throughput even when fully extended upward. Easy fix, though: use tin snips to cut away opposite quarter sections of the hair-trap basket that fits into the drain pipe. Then be careful about keeping your hair out of the sink. But you won't have to worry about this fairly shallow sink overflowing when you've the water on full-force. Very happy with this vessel sink. It is a nice, thick glass and a great modern shape. I ordered two of them for a double vanity and they were the perfect update. I did not realize that this sink does not fit flat on the counter and it is not very deep, so water gets under it and is hard to remove. "What does verified purchase review, mean that sink does not fit flat on the counter? I was getting ready to purchase until I read that ." wanted a clear glass vessel sink. This was the right size and the right price.